The regression line, that is. John’s post on “the ‘formidable campaign’ narrative” offers some apt words of caution regarding one popular explanation for the president’s reelection. Alas, that’s a bit like trying to bail out the ocean with a bucket. There’s always more ocean; and there are always more plausible-sounding special explanations for Obama’s victory—including demographic shifts, early ads, clever micro-targeting, and a fortuitous storm, among many others. Some of them may even have merit. But what all of them have in common is that they are superflous. In 2012, as in 2008, Obama’s electoral performance was quite consistent with what might have been expected on the basis of political fundamentals. Perhaps the president deserves some sort of award for his unmatched fidelity to the “laws” (irony intended) of political science. We have lots of distinct but broadly consistent statistical analyses of presidential election outcomes. My own favorite is based on just two factors: the income growth rate in the second and third quarters of the election year and the incumbent party’s tenure in office. The figure above combines these two factors by relating election outcomes to tenure-adjusted income growth, which simply subtracts 1.29 from the actual income growth rate for each consecutive term (beyond the first) that the incumbent party has held the White House. Details of the regression analysis appear after the jump. Statistical analyses of this sort provide useful benchmarks for interpreting the result of any specific presidential election. For example, the 2012 election outcome (which appears almost exactly in the center of the figure) fits the historical pattern of post-war presidential election results splendidly; Obama’s popular vote margin was 3.8%, while his expected margin (based on the preliminary tabulations of real disposable income currently available from the Bureau of Economic Analysis) was 4.6%. (Subsequent revision of the income figures may push the 2012 data point to the left or right, but is unlikely to move it far from the regression line.) The 2008 election outcome (near the lower-left corner of the figure) was also quite consistent with the historical pattern; McCain trailed Obama in the popular vote by 7.3 percentage points—slightly better than expected, given the dismally low −0.8% mid-year income growth rate and eight years of “incumbent fatigue” due to George W. Bush. Perhaps we need a Political Science Balanced Budget Act as a constraint on election interpretation. Anyone who wants to believe that Obama’s “formidable campaign” (or whatever) won him more votes than an ordinary campaign would have won should feel free to do so, but should be required to propose some equally plausible source(s) of vote losses to balance the ledger. You can’t just add a positive number to 4.6 (or whatever analogous baseline figure you prefer) and get 3.8. Finally, on the subject of next time, this analysis suggests that any income growth at all is likely to be sufficient for reelection when a party has held the White House for only four years. (Indeed, the only incumbent party candidate in more than a century to have lost under that circumstance was Jimmy Carter, who ran for reelection in the midst of an election-year recession more severe than the Republicans’ in 2008.) That was a lucky thing for Democrats in 2012. But now things get harder. Holding the White House again in 2016—regardless of who the competing candidates turn out to be—will probably require a significantly more robust election-year economy than last year’s. On that score alone, Any Republican should, for now, be considered a modest favorite. Incumbent Party Margin = 9.93 + 5.48 × Income Growth – 1.76 × Years in Office. Incumbent Party Margin represents the incumbent party’s national popular vote margin in percentage points. Income Growth is measured by the change in real disposable personal income per capita in the second and third quarters of the election year (Q14 and Q15 of the president’s term), also in percentage points. Years in Office is a counter indicating how long the incumbent party has held the White House. The regression parameters are estimates based on data from the 17 presidential elections since the end of World War II. This is an updated version of a regression model first proposed by Chris Achen and me in a 2004 paper entitled “Musical Chairs: Pocketbook Voting and the Limits of Democratic Accountability.” (We were interested in the implications of voters’ apparent focus on income growth over a very short time-horizon, just a fraction of the election year.) Including the three additional presidential elections that have occurred since then improves the fit of the model slightly, but leaves the parameter estimates essentially unchanged—unusual luck in this sort of exercise. It seems worth stressing that this regression model is not intended as an election forecasting tool. The relevant data on income growth are not available soon enough to be useful for forecasting; and in any case, an analysis aiming merely to maximize predictive accuracy would focus on state-by-state rather than national results, and would incorporate additional information such as contemporaneous polling data—which seems to me to take us outside the realm of “political fundamentals,” and to provide a less useful baseline for most analyses of campaign effects. What If the Obama Campaign Didn’t Win Him the Election? Do you view “years in office” as a cause of outcomes? (I’m thinking about the aggressive criticism of variables like it by Doug Hibbs who has written, for example, that “By my lights, such time-coded variables defy scientific justification and are just ad-hoc ways of picking up fillips to vote shares not explained by objectively measured substantive variables” (http://www.douglas-hibbs.com/HibbsArticles/HIBBS_OBAMA-REELECT-31July2012r1.pdf). By my lights, Hibbs has earned the right to express whatever prejudices he wants to express about scientific justification of variables in this domain. However, my own standards on this point are somewhat less rigid than his. What, exactly, are “objectively measured substantive variables”? “Years in Office” is pretty “objectively measured,” so presumably it is not “substantive.” But what makes “Income Growth” “substantive” (in my operationalization, or Hibbs’s, or any other)? We can tell ourselves a story about why the state of the economy should matter to voters; but if we had learned over decades of observation that election outcomes were strongly related to (objectively measured) sun spots, we would have a story about that, too, and sun spots would then presumably be a “substantive” variable by Hibbs’s standards. We are an infant science in which observation justifies theory, not the reverse. The more practical concern is about statistical overfitting in analyses with lots of plausible variables and very little data. (See, for example, my old impolite commentary on Ray Fair, “Econometrics and Elections.”) But I don’t think that is an especially big problem here. Tenure variables have appeared in models of this sort for many years, and if they were going to stop working they could easily have done so by now. Moreover, excluding the two high-leverage observations (1948 and 1952) from this analysis leaves about 90% of the estimated effect intact. For what it’s worth, I view “Years in Office” as capturing–imperfectly but systematically–a variety of not-very-well-understood effects, both institutional (exhaustion of the party’s policy agenda; exhaustion of its most talented appointees) and psychological (voters’ vague but real sense that it’s “time for a change”). A nice example of how such effects can be fleshed out is the scatterplot in THE PARTY DECIDES relating the ideological moderation of out-party candidates to the length of time the party has been out of power. Presumably Hibbs would consider ideological moderation a “substantive” variable; but measuring it directly raises a variety of additional complications, and “Years in Office” turns out to be a pretty good proxy. Is this chart based on 1.29 points per term or 1.76 points per year? And what growth rate are you using? I can’t get the arithmetic to work out. The “tenure-adjusted” income growth shown in the chart is actual growth (of real disposable income per capita in the second and third quarters) minus 1.29 for each additional term in office. (In 2008, the actual growth rate was -.79, so the “tenure-adjusted” growth rate is -.79 – 1.29 = -2.08.) This is just a trick for representing both effects in a single chart. The adjustment reflects the relative magnitudes of the two effects: an additional term in office reduces the incumbent party’s expected margin by 1.76 x 4 = 7.05 percentage points, which is the same hit (within rounding) as a reduction in income growth of 1.29 (since 5.48 x 1.29 = 7.07 percentage points). Sorry–that was more confusing than necessary and probably didn’t answer your question. Each additional percentage point of real income growth increases the incumbent party’s expected vote share by 5.48 percentage points; and each additional four-year term in office reduces the incumbent party’s expected vote share by 1.76 x 4 = 7.05 percentage points. That’s what I thought. But RDIC growth rate in Q2/Q3 of 2012 was about 0.6%. That gives me 9.93 + 3.29 – 7.05 = 6.17. But you say it comes out to 4.6. Are we using different estimates of the growth rate? I’m using the change from the previous year. Should it be something else? Percent change over the second and third quarters–i.e., comparing income in Q3 of the election year with income in Q1. From NIPA Table 7.1, line 12, real disposable personal income per capita was $32,691 in Q3 vs. $32,586 in Q1, an increase of 0.32%. So, 9.93 + (5.48 x 0.32) – 7.05 = 4.63. An implication of this operationalization is that economic events before the start of the election year have no effect, for better or worse. I should note that, in our original paper, Achen and I measured income growth over the same period but translated the percentage changes into annualized rates. That doubles the income growth numbers, which reduces the coefficient relating income growth to votes by 50%; but the meaning is unchanged. I have come to think that it is more intuitive to deal with actual growth over a specified period of time than with annualized growth rates–though that may be wishful thinking. As re: 1956, Eisenhower had a 69% approval rating in May that year. 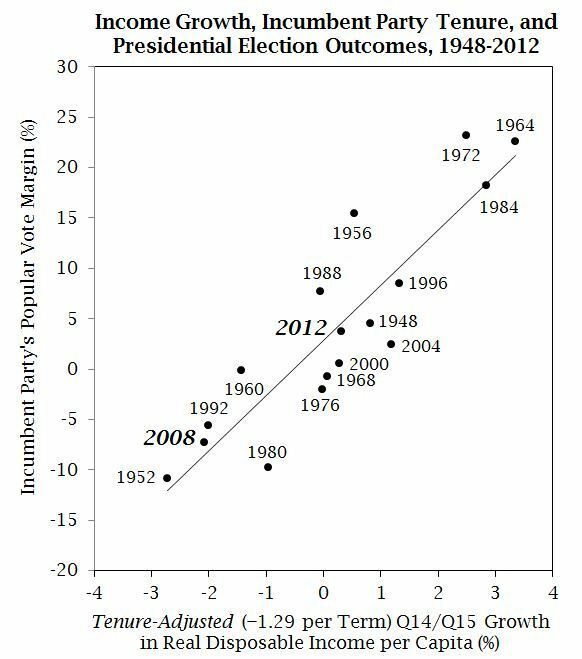 When I referred to Eisenhower’s reelection as a “surprising landslide,” I didn’t literally mean that people woke up the morning after the election and were shocked to hear that he’d won big; I meant that the result was poorly accounted for by this specific simple regression model. Lots of scholars do use approval ratings to “explain” election outcomes, but I don’t find that a very interesting exercise–thus, I am only “somewhat” less rigid than Hibbs in my scientific tastes. I saw that footnote about income growth prior to the election year and during the election year, but I’m not sure what it means, and there are no results presented. There are some analyses employing prior-year income growth reported in my paper with Achen, in Chapter 4 of UNEQUAL DEMOCRACY, in my 2011 Monkey Cage post on “The President’s Fate,” and in my 2012 Campaign Stops post “Too Much Like Musical Chairs.” They all suggest to me that the prior-to-election-year effects are not very large and not very reliable (with the possible exception of the apparent _negative_ effect of inauguration-year growth in “The President’s Fate,” which is large and suggestive but a big strain on the data).